YUMMY green smoothie. 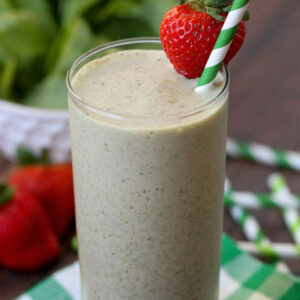 Recipe includes pineapples, spinach, strawberries, & bananas. Add all ingredients to your blender and mix until well combined. If items were not frozen beforehand, add ½ cup ice to make it cold. This makes about 2 -3 cups. For more add ½ cup strawberries, ½ cup spinach and ½ cup more mil or water.